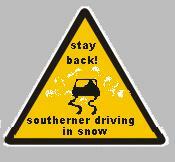 Yesterday as I drove to my field education site, I realized that I was that southern guy trying to drive in snow. We merely had gotten a few inches, but since this is my first winter in New Jersey with a car, I know remember that I hate driving in the snow. I hurdled myself down the freeway at 50 mph, but was being glared at by the passing SUVs. You see down south the concern is not snow but ice–so what I do not get is when the temperature is under 32 degrees how the puddles are not sheets of ice. Anyway, I figured I might as well prosper on my ineptitude and fund a new warning sign that the DMV gives out to all of us transplants. PS for those who only have blizzards and snowstorms and have not seen what an “Ice Storm” is. ← series: what do I mean by "dialogue?"